I've found the older I get, the less tolerant my body is of amusement park rides. I've tackled some serious roller coasters in my life in places from Knott's Berry Farm, to Elitch Gardens to Disney World, but things have changed. I can’t even swing without getting nauseated. I think my body’s done all the jarring and shaking it’s going to do and is now adamantly opposed to such shenanigans. Starting last May, I felt as though I was stuck in a bumper car, or on an evil merry-go-round that wouldn’t slow down to let me off. I was either stalled or going a mile-a-minute, and it overwhelmed me. So I did what I had to do. (No, I didn’t hurl and gross everyone out, thus forcing the carny to stop the ride.) I merely jumped off. I had to step away for a bit. At the time, I didn’t know for how long, but I knew I needed to get my feet on the ground and make the spinning stop. I talked to my writer’s group and said I would be taking the summer off and would reassess things come August. That alone relieved me of a great deal of pressure (most of which, self-imposed). When I gave myself permission to take a break, I felt better; my stomach settled and my brain focused. I spent time with out-of-state family visitors, read a ton of books (staying away from too many ones on writing ), and caught up on some movies and television shows. However, I didn’t stray too far from writing as I started my own freelance editing business, so I also worked on my oxford comma and passive voice lectures. It was just enough to keep me from getting too woozy. And it eventually paid off. As if struck with a flying caramel apple, I got my next book idea and have written several pages of a young adult novel I’m very excited about. So what’s the point? 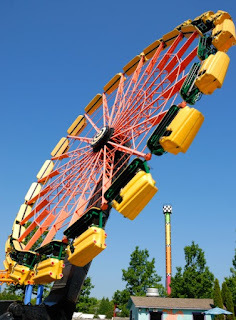 If you’re feeling like you need to get off the Tilt-a-Writer, there’s nothing wrong with making a leap onto stable ground. Take a break. Sometimes getting away from something is the best remedy so you can return with a clear head. And when you’re ready to join the carnival again, go for it—even if it’s just the kiddie rides. Stress is bad, especially self-imposed stress. Relaxation and taking breaks is good. You did the smart thing. I like the analogy, but have never been too crazy about wild rides. Good luck.